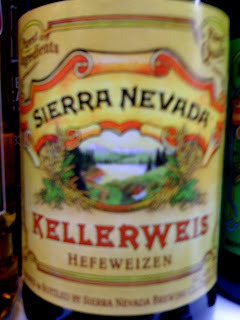 Deveneys of Dundrum: Sierra Nevada Kellerweiss. It's a rarity to find an American Hefeweizen that actually resembles a Hefeweizen, apart from Flying dog In-heat wheat, of course. I have struggled to find a take on a traditional German that had both the clove and banana nose teemed with a heavy bready palate. Sierra Nevada have managed to pull quite an authentic style out of their Californian bag. This is one of the only American Hefeweizen's made using the traditional Bavarian style of open fermentation, this technique adds complexity and depth to the flavour and is quite evident in the finished product. It pours cloudy, golden with a bright white head. The nose is all clove, banana and notes of warm dough. The palate is yeasty, fruity with an element of spice and a malty finish. The mouthfeel is quite light - light enough to have more that 3 without slipping into a wheat beer coma, crisp and creamy.